Geoffrey Khan studied for a B.A. degree in Semitic Languages (Hebrew, Aramaic, Arabic, Akkadian, Ethiopic) at School of Oriental and African Studies, University of London, which he completed in 1980. Thereafter he went on to graduate studies in the same institution and was awarded a Ph.D. degree in 1984 for a thesis entitled Extraposition and Pronominal Agreement in Semitic languages, which concerned form and function of various syntactic structures in Arabic, Hebrew, Aramaic, Akkadian and Amharic (subsequently published as Studies in Semitic Syntax, 1988). In 1983 he moved to Cambridge, where he was employed as a researcher on the Cairo Genizah manuscripts in the Taylor-Schechter Genizah Research group at Cambridge University Library. In 1993 he was appointed as Lecturer in Hebrew and Aramaic at the University of Cambridge. 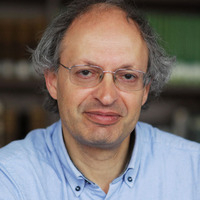 He has subsequently remained in Cambridge, being promoted to Reader in Semitic Philology (1999-2002) and Professor of Semitic Philology (2002-2012). In 2012 he was elected as Regius Professor of Hebrew, which is his current position. Some of his honours include election as Fellow of the British Academy (1998), election as Honorary Fellow of the Academy of the Hebrew Language (2011), election as Fellow of Academia Europea (2014), election as Honorary Member of the American Oriental Society (2015), election as Extraordinary Professor (Honorary) by the University of Stellenbosch (2016), the award of the Lidzbarski Gold Medal for Semitic philology by the Deutsche Morgenländische Gesellschaft (2004) and the award of honorary doctorates by the Hebrew University of Jerusalem (2017) and the University of Uppsala (2018). Professor Khan teaches a course in Comparative Semitic Linguistics to final year undergraduate students. The research of Geoffrey Khan includes philological and linguistic studies of Hebrew, Aramaic and Arabic. He has a broad interest in all periods of the Hebrew language and is editor-in-chief of the Encyclopedia of Hebrew Language and Linguistics, which was first published in 2013 (Boston: Brill) and is updated on an annual basis. This contains approximately 1,000 articles on all periods, traditions and methodological approaches to the Hebrew language. He has a specific interest in Biblical Hebrew. In his Ph.D. thesis he addressed various aspects of Biblical Hebrew syntax and subsequently worked on a variety of manuscript sources relating to the Tiberian Masoretic tradition and the pronunciation traditions of Biblical Hebrew. A concise overview of his work in this field can be found in his book A Short Introduction to the Masoretic Hebrew Bible and its Reading Tradition (Gorgias, Piscataway, 2nd edition, 2013). Closely related to his work on the Tiberian Masoretic tradition is his research on medieval Hebrew grammatical thought, especially that of the Karaite grammarians, who were closely associated with the Tiberian Masoretes. He has been commissioned by Oxford University Press to prepare the Oxford Grammar of Biblical Hebrew, which will present an updating and major expansion of Gesenius’ Hebrew Grammar. Geoffrey Khan’s interests in Aramaic focus for the most part on the documentation of modern spoken forms of the language. He has undertaken extensive fieldwork on the many endangered dialects of the so-called North-Eastern Neo-Aramaic subgroup, which were originally spoken in northern Iraq, southeastern Turkey and western Iran. This research has resulted in the publication of a variety grammatical descriptions and an on-line database. In the field of Arabic his main published research has been on medieval Arabic documents. He has edited various corpora of documents, including Arabic papyri from early Islamic Egypt, documents from early Islamic Khurasan, and documents from Fatimid and Ayyubid Egypt that have been preserved in the Cairo Genizah. He is currently working on documents from the Fatimid period that were discovered in Qaṣr Ibrīm (Nubia) by the Egypt Exploration Society. He also works on some aspects of the history of the Arabic language, in particular the development of Judaeo-Arabic at various historical periods, including the modern spoken varieties, on which he has carried out fieldwork. Mr Nicholas Posegay: Relationships between medieval Arabic, Hebrew, and Syriac in the fields of vocalization and phonology.